One weekend last month I got up at 4:00 AM so that I could open the gates at Frank Lloyd Wright's House on Kentuck Knob for the Westmoreland Photographers Society sunrise shoot. What an incredible experience to watch the world awaken from the top of that hill! While the photographers checked their shutter speed and adjusted their tripods, I wrote. Maybe they'll say that when they read the revised chapter in my recent novel. The setting is certainly better for it and so is the mood. You see, we didn't have the bright sky and blooming color that morning, we had the swirling clouds and the river valley mist that crept skyward. The unfolding scene did more to inspire me than the latest tips from professionals in a magazine and more to calm me than my daily yoga. 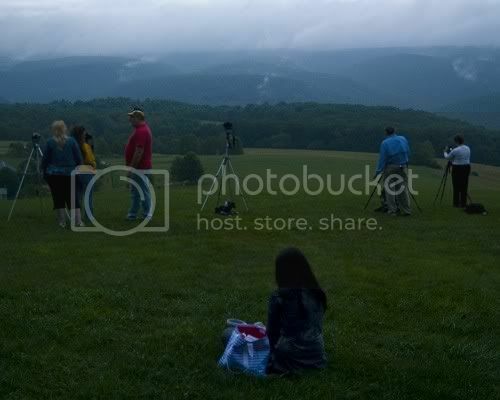 Incidentally, you can see the weekend's final photographs at an exhibit at Kentuck Knob this Saturday from 10:00 AM - 5:00 PM. I'll be there, as well the photographers, so say, "Hi!" if you stop by. The photograph seems to captures the mood of the occasion; and certainly writing from direct experience can bring life to writing.